Special thanks to bruddog, buck, and pambazos (zone read plays) for helping me understand play-making, and to tecmobowl.org. The BoltMAN's 1st effort was golden. Hey, nice coloration on those Bears (vs. G.B) uniforms! however, I think you've got the CAR/DAL uni's looking too similar, when they play eachother. Hm, I see what you mean. Will probably change that for next year. Can you make a max juiced version of this year's game? 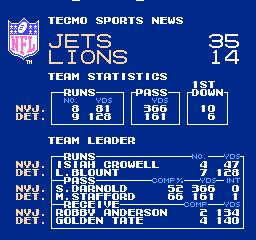 It is definitely my favorite version of tecmo super bowl. No, I only release one rom per year. By the way, the Chiefs are rated #14, which is above average. They have a top 3 RB (Hunt), a WR who's the only offensive player in my game with a 75 MS (Hill), NFL's second best TE (Kelce), and the fifth best overall DB in the game (Berry). Mahomes has been far better than anyone anticipated so he's obviously under-rated here (though he still has 38 MS and an 88 ARM), but the overall team is definitely not atrocious. Thanks for the work. Love the new RPO plays. IMO when you play MAN COM is too good too much of the time. Like a challenge but also like to be relevant which often you're not against COM. Just my opinion though.